I have been quietly following a magical undertaking by Erika, of MIKODESIGN. I first pointed her out to you in my enjoy section when she threw a gorgeous Frida Kahlo party for her daughter. Well... she's been at it again and I want to shout about it! 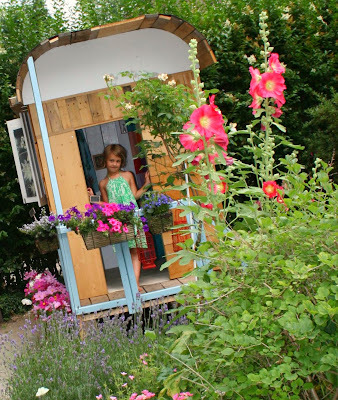 Erika and her family created the most innovative playhouse I've ever seen! 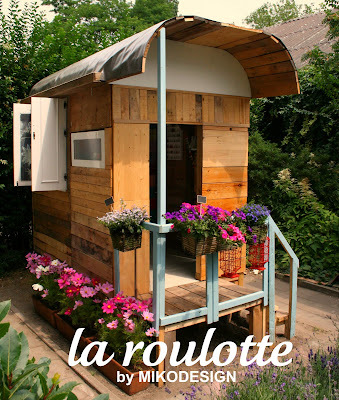 They were inspired by a French gypsy caravan, La Roulotte. When I wrote to Erika to gush my everlasting love and admiration for their creativity, she said "...and the best thing, almost all of the materials we used are recycled, vintage, given and handmade... it took us a lot of weekends, but it was a great family project, working outside is so much fun...". Their lucky girls get to play make-believe in this dreamy little carriage house, surrounded by hollyhocks and lavender. What more could you want? My daughter and I are ready to pack a vintage portmanteau and hop on a plane to Holland! You can see the full project on her flickr set, here. Thanks Erika, for sharing your lovely photos and inspiring us with your enchanted life! How cute is that little playhouse! Oh how gorgeous is that?! And what a lovely garden! And a Frida Kahlo party?! Wow! What a lovely find! I would still love my very own gypsy caravan playhouse today. Actually maybe I will rename my hive to "la roulotte"! Or maybe I will get out my chainsaw and built a playhouse in the shape of a hive! I couldn't stop thinking about the Frida Kahlo party when I read about it - so inspiring! And this is gorgeous too! You would love Holland Maya. Definitely a place you should visit. I adore gypsy caravans and this one is just perfect. I would definitely put a vintage trunk filled with dress up clothes and jewelry in it for all the gypsy visitors big and small. What a wonderful playhouse. Can you imagine playing in that as a child? Pure magic. Wow - what a lucky little girl - that is too cool! Yum! I think her Frida Kahlo party was truly inspired and in fact would love to have one for myself--in a gypsy caravan! I love how she followed the spirit of the gypsies by using vintage and upcycled items. It wouldn't do to have that all new! Just popping in to let you know your blog is great and to thank you for the travel pillow tutorial - I just made three this morning!!! Thanks so much. that is way cute, wish i was handy enough to make that happen!